“Jadeveon Clowney could potentially be the top overall draft pick in 2014,” said everyone in America. “Andrew Wiggins could potentially be the top overall draft pick in 2014,” they all continued before the season even started. Too often now, may people start drooling over “draft prospects” when they are just coming into the major college ranks or even when they are still in high school. I can honestly say that Clowney, to me, was overhyped. In their season opener against North Carolina, UNC just ran plays the other way. Lo and behold, no Clowney affect. 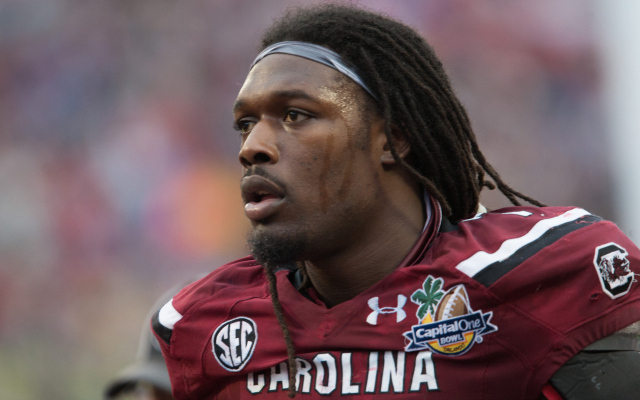 Enough about Clowney, what about others? Kansas Guard Andrew Wiggins, a freshman, said prior to the season that this would likely be his only season playing college basketball. In 2013, Nerlens Noel left Kentucky after his freshman year, even though he tore his ACL early in SEC play in a game at Florida. Is the draft really as prestigious as we all want it to be? Or are we simply ruining the young, promising careers of what we assume to be world-class athletes, like Jadeveon Clowney?